A number of developing countries are heavily dependent on exports of commodities for foreign exchange earnings. For example, approximately three quarters of Zambia’s export revenue comes from copper. 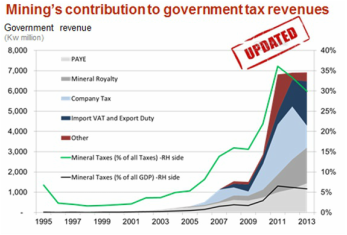 Rises in commodity prices can bring significant benefits to economies such as that of Zambia, including increases in tax revenue which can be used to improve development (see Fig. 3.1). ​As of 2013 Zambia had a positive trade balance of $2.01B in net exports. As compared to their trade balance in 1995 when they still had a positive trade balance of $501M in net exports. However, fluctuations in commodity prices can also have a significant impact on the terms of trade of a developing country such as Zambia. 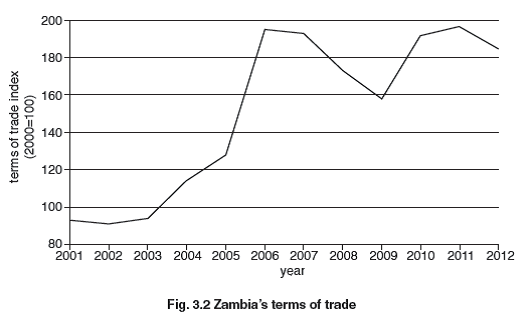 The trend in Zambia’s terms of trade, for example, is shown in Fig. 3.2. Despite the fact that copper accounts for over 75% of Zambia’s export revenue, it still only contributes 10% to government tax revenue. The Zambian government has expressed concerns that multinational companies engaged in the extraction of copper, and international commodity traders, have been evading paying tax. As a result, the Zambian government temporarily suspended exports of copper in 2011 as it considered rules to improve revenue collection from the sector. This was seen by many as part of a trend in Africa towards so-called ‘resource nationalisation’ as African governments sought a larger share of the profits from mines, as well as expanding state control. The Zambian government has been in talks with multinational companies to acquire a 51% stake in mining operations to ensure that the benefits of resource extraction are more widely distributed among the population of Zambia. Some economists are worried that greater state involvement and higher taxes might discourage investment in mining and in other sectors of the economy, resulting in a reduction in the growth of output.